Fighting in Duékoué caused hundreds of deaths and widespread destruction. Many civilians sought refuge in a crowded camp and now they fear returning home. A camp outside of Duékoué is over capacity with around 28,000 people, following three days of intense violence in the city. In western Ivory Coast, many people who fled violence dare not return home. On the road between Guiglio and Blolequin, villages have been deserted by those who have fled to Liberia to seek refuge or are still hiding in the bush. In this area of the country, post-electoral and inter-communal tensions came to a head recently in the town of Duékoué during three days of violence. From March 28 to 30, the fighting caused hundreds of deaths, as well as widespread destruction in the town. Many civilians sought refuge in an already crowded camp on the grounds of a Catholic mission nearby. Now they live in fear of returning home—although their homes are just a few hundred meters away. A Doctors Without Borders/Médecins Sans Frontières (MSF) team has been providing medical care in the camp on a daily basis since December. 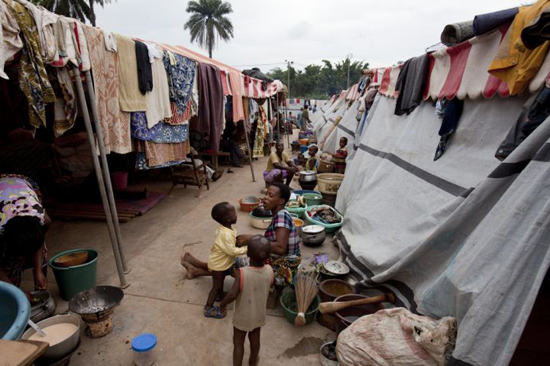 The three days of violence in Duékoué saw the number of people sheltering in the camp double to approximately 28,000. The distance between the violence raging in the town and the relative safety of the camp was just a few hundred meters, and most civilians made it there on foot. But now they are paying a price for that safety; living conditions in the camp are extremely harsh, with overcrowding, a lack of shelter, and short supplies of food and water. The lack of space is the most critical problem. With an estimated three people per square meter (one square meter equals 10 square feet), people make use of every bit of land and must literally sleep on top of one another at night. As it gets dark, the market, the cooking area, and even the space outside the MSF dispensary become filled with families sleeping on pieces of cloth, with nothing above their heads but the stars. That is on a good night. Over the last week, heavy rains have hit the area, causing mayhem in the middle of the night as people seek cover, dig new trenches to collect the rainwater, and try and sweep away the water and mud so they can lie down and get some more sleep. The pressure on the camp is enormous. The number of people sheltering there far surpasses its capacity, and more are continuing to arrive. In surrounding villages, many people are still hoping to make their way to this dreadful safe haven. Although there are other medical organizations working in the camp, MSF is the only one actually providing curative medical care. In an area where malaria is a major killer, MSF’s presence in the camp provides a lifeline to displaced Ivorians who are sheltering there, especially children. Because of ethnic tensions and the threat of violence, most people are too scared to make their way to the hospital, even though it is just a short walk away. In recent weeks, the team has provided more than 200 consultations a day. “We are also seeing a lot of respiratory infections and diarrhea, which, in many cases, are probably linked to the living conditions in the camp,” said Dr. Mohamadou Seyni. MSF is also closely following the nutritional situation, and is alert to the possibility of rising levels of malnutrition. At present, 50 malnourished children are being taken care of by the team. Although it is difficult to make a definite link between malnutrition and displacement, it is likely that the lack of money and food experienced by many families over the last few months will have had an impact on people’s health. Most families in the camp came here in a hurry and arrived with few—if any—possessions, and little money. “I came to the camp with nothing but what I am wearing now,” said Paul, who came to the camp on March 29 to escape the violence in the streets. There are other issues of particular concern to MSF. Back in February,a number of children in the area were diagnosed with measles, but the vaccination campaign planned by the health authorities was cancelled when violence broke out. With large numbers of people displaced from their homes, something will need to be done to prevent a measles outbreak. In the shaded waiting area, benches are filled mostly with mothers holding their children. A group of pregnant women wait in an adjoining area, hoping to give birth safely. An MSF midwife sees about 40 women every day for antenatal consultations. Any hopes they hold of their children being born outside this camp are remote, but at least they will receive proper follow-up care. The MSF logistics team is building a larger shaded area to replace the tent currently being used as a waiting room—an indication that the camp’s residents and their medical needs are here to stay. Outside the camp, people still fear for their lives. Although for many, home is just 10 minutes down the road, it has never seemed so far away.